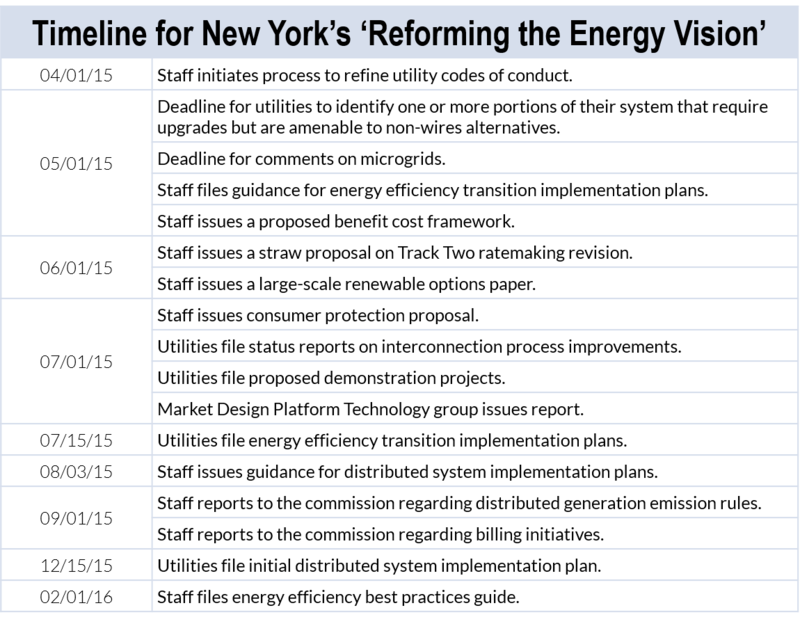 By William Opalka and Rich Heidorn Jr.
New York’s overhaul of the electric industry, which seeks increased reliance on distributed energy resources, will largely bar utility ownership of those assets. The state Public Service Commission on Thursday took another step in its Reforming the Energy Vision process with a 133-page order establishing a “policy framework” for the development of markets for distributed energy resources (14-M-0101). From their place between NYISO wholesale markets and market participants and end-users, the utilities will integrate distributed resources by balancing supply and demand-side resources through real-time load and network monitoring, enhanced fault detection, automated feeder and line switching, and automated voltage and reactive power control. “It is anticipated that over time, DSPs will increasingly rely on [distributed resources] to maintain reliable system operations during both ‘blue sky’ days and significant system events,” the order said. Although there will be room for geographically unique products, there will be a standard market platform for the entire state to ensure efficiency for providers and multi-site customers. “This requirement extends beyond the ‘common look and feel’ of customer orientation, into the technical protocols and market rules to which aggregators and service providers must conform,” the PSC said. 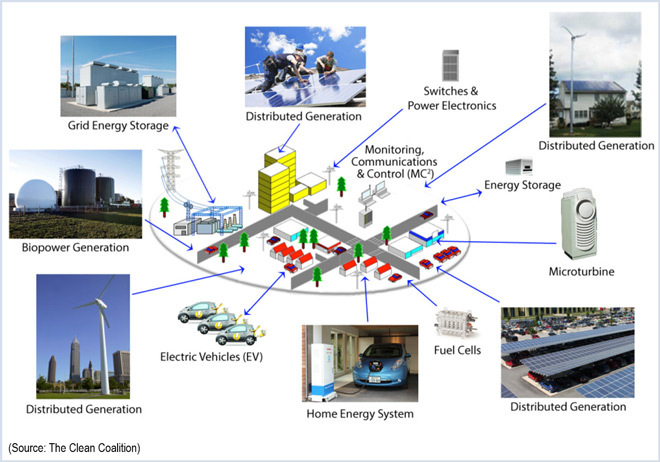 NYISO could accept demand reduction bids directly from DER providers, dispatching demand-side reductions in competition with supply-side resources, or accept bids from a utility acting as an “aggregator of aggregators.” Alternatively, utilities could use contracted DER to modify its load shape when it bids into the wholesale market to serve its load. “Demand is becoming an integral resource in the operation of the grid and we have to change regulation to do that,” PSC Chair Audrey Zibelman said at the commission meeting. “In the limited situation that utilities will be allowed to own DER as a regulated asset, they will be restricted to recovery of their actual costs,” the commission said. To increase penetration of energy efficiency, utilities will also be required to expand their programs — currently based on direct rebates and subsidies — to include third-party companies. “The state’s greenhouse gas reduction goals demand that we achieve significantly more efficiency than is practical to achieve through current ratepayer-funded direct subsidy programs,” the commission said. The commission said it will protect consumers by requiring certification of any DER provider that requests consumer data, or that furnishes services via DSP or other utility functions. “Warranty and disclosure requirements will also be considered,” the commission said. The steps are consistent with the draft State Energy Plan, which calls for the use of markets and reformed regulatory techniques to improve system efficiency and customer empowerment and reduce carbon emissions, the PSC said. “By requiring utilities to modernize their business models and meet evolving customer demands, New York is committed to forging a new path to develop a dynamic, customer-oriented power grid able to drive clean energy markets to scale,” Richard Kauffman, chairman of energy and finance for New York, said in a statement. The proceeding was separated into two tracks, with Track One focused on developing distributed resource markets, and Track Two on reforming utility ratemaking. The PSC’s staff says that utility financial incentives should be structured “to reward utilities for the efficient development of DER on their systems in a manner that either makes them indifferent to ownership, or favors ownership by third parties.” Staff will provide a straw ratemaking proposal by June 1. Approved the first community choice aggregation pilot program in New York. It will allow Westchester County municipalities to issue solicitations for natural gas or electricity supplies for local residents and small businesses (14-M-0564). Stayed its December decision that restricted how customers with multiple locations could participate in net metering programs and postponed its rule requiring utilities to file new tariffs to resolve concerns about how such customers are compensated. The ruling, which gives renewable energy developers and utilities more time to transition away from existing net metering rules, means solar projects already under way will be eligible to receive net metering credits (14-E-0151, 14-E-0422).